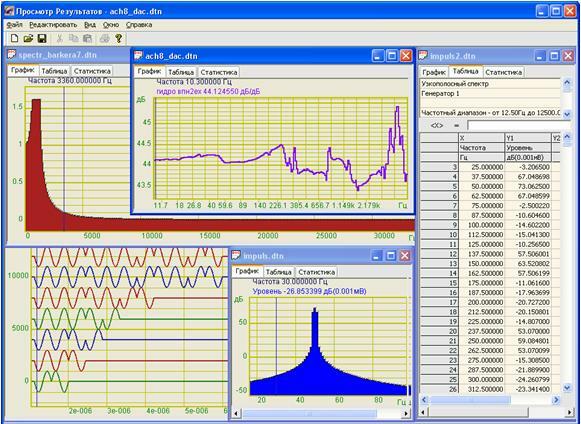 New programs appeared: processing and viewing of measurement results, data converter and ZFormula software environment. The program for viewing and processing results allows you to load simultaneously several data files obtained with the help of ZETLab programs, view and edit data in the graphical and tabular form. You can also copy and paste data from ZETLab programs running in real time. You can combine the graphs with the scaling of the frequency and time scales. One can superimpose the octave spectrum on a narrow-band uniform spectrum and vice versa. The data in the table form can be edited and modified. You can perform various operations with data columns – summarize, subtract, smooth, perform various mathematical operations, calculate various parameters. The “Preview Results” program supports the print function.